But putting off required repairs or maintenance to save on these costs and trying to do the same inhouse without the necessary expertise would ultimately cost you more because you will waste money on labor, inks and media to cover up for the inefficiency, and you might have to deal with displeased customers and eventually lose their trust in case the equipment goes down. While we encourage servicing your own equipment, especially for the regular maintenance, one needs to understand that these equipment are complex machines and beyond basic maintenance and repairs, most issues are best handled by professionals. Just like you would treat a minor cold and cough at home, and leave the job of removing a tumor with the surgeon, the same applies to large format equipment as well. 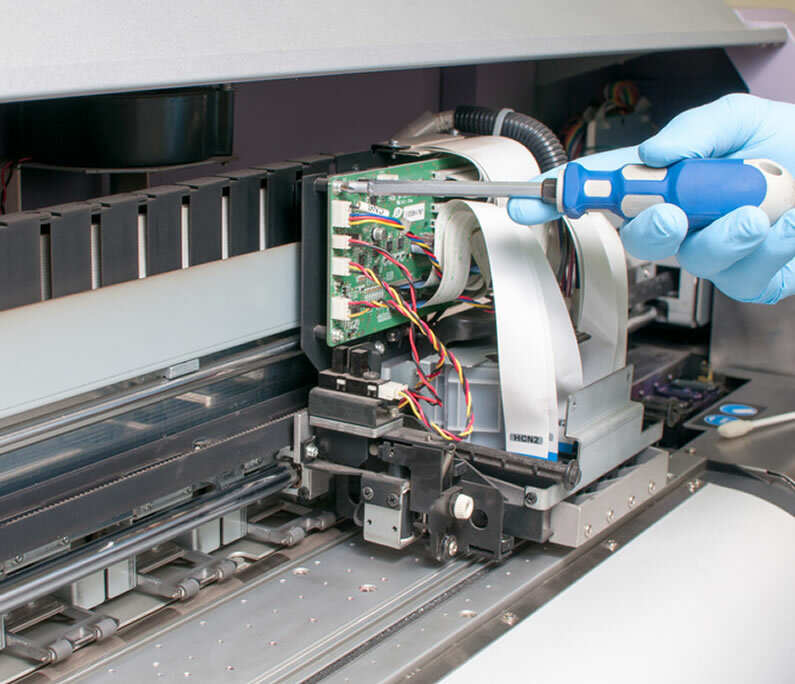 1> Take good care of your printers and finishing machines by regularly maintaining them and replace only the less expensive and easy to replace parts on your own, and that too, only if you are confident. For the more complicated issues, leave the work to the professionals. 2> Extend your warranty/service contracts if possible before the expiration of your existing warranty. The peace of mind that you can get with an extended warranty outweighs the few thousand dollars of the warranty cost that you pay upfront. 3> Also, it is very important that you familiarize yourself with the warranty requirements and restrictions so that in future you do not commit any action which is against warranty guidelines, thereby letting the manufacturer not honor the warranty. A company that provides professional service will always take responsibility for its work and the parts it sells. Before you decide to take things in your hands, you should ask yourself what is the real cost of things that may go wrong? We bet, if you answered this question truthfully, you would always call a professional. Media One has trained and experienced technicians on the East and West Coast to help you with your equipment problems. To get help, please email web@mediaoneusa.com or call 833-HELLO-M1 (Note that our service offerings are prioritized for our customers who have bought our equipment in the past).